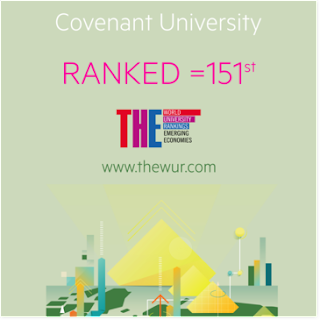 The best private school in Nigeria, Covenant University after breaking so many feats in the past has again broken another as the 151st in the world (emerging economies ranking parameters) according to Times Higher education ranking. The school was listed in the top echelon of the most research driven institution in the world following the university's commitment to delivery every time. The ranking came on the 15th of January following the '2019 Times Higher Education Emerging Economies Summit' which was held in Doha, Qatar. Present at the event were presidents, Vice chancellors, Policy makers, Rectors, as well as Industrial executives sharing their views on how the understanding of the importance of research can help greatly in nation's development. Remember that in 2018, covenant university also broke the record of crossing 1000 publication threshold (in just one year).